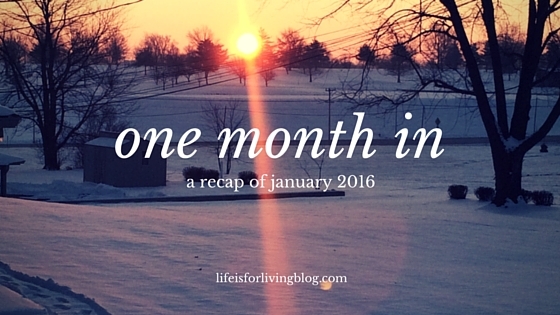 We're officially over a month into 2016, so it's time to evaluate. How are your goals looking? I'm excited to say I'm still pretty focused and determined to accomplish (at least some of) mine. Allow me to give you the deets. I'm really wanting to dig deeper into the Bible than these plans go, though, so I'm making new Bible study plans for February. I'll keep doing these plans on my phone in the mornings, but in the evenings, I want to get out my actual Bible and a notebook and do some more serious personal reading. 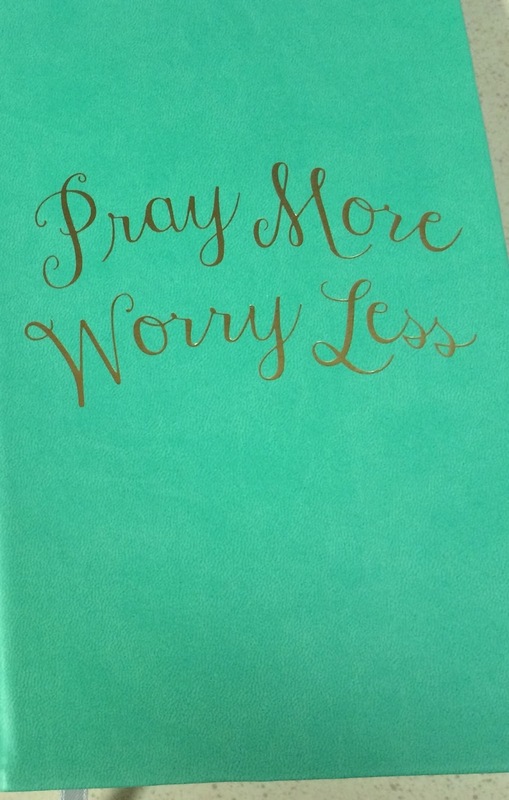 It seemed like the perfect prayer journal for this worrying woman. 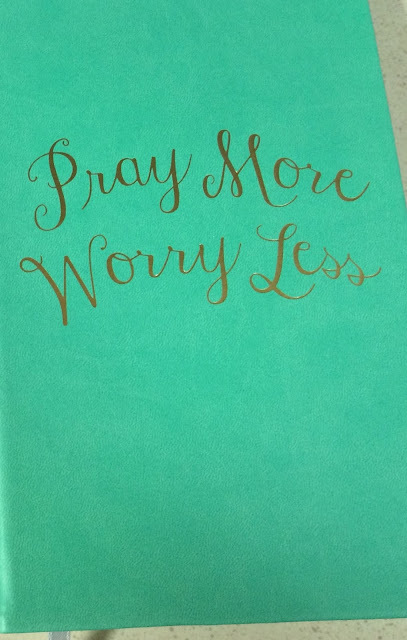 Starting this month, I'm going to write down my prayer requests, use it to pray daily, and update it regularly as needed. I'm so excited to share that, on both of my two Sundays off in January, Matt took the days off as well and went with me to the non-denominational church we first visited back in November. Though he has a few issues with the place (primarily the contemporary worship music and the replacement of KJV with ESV), I'm happy there so far. The pastor is an excellent teacher, and he's been doing a really great series on Jesus's sermon on the mount. I'm off this Sunday as well, and Matt is, once again, planning to take off and join me at church! I finished Mere Christianity by C.S. Lewis two weeks into the month! Though I wouldn't say it was an easy read by any means, there were a lot of insightful, thought-provoking ideas shared in the text. I enjoyed it. For my birthday, I gave Matt a list of things I wanted (per his request). Things on the list included albums from Matt Redman, Chris Tomlin, and...dcTalk. Matt surprised me by getting all three! Also, on one of my Sunday workdays, I listened to a sermon podcast from the church we've been visiting since I wasn't able to attend that morning. That was pretty neat. Though this is probably the easiest goal on my entire list, I haven't done it since week one. I've gotta get on it this month. WOOHOO!!!! 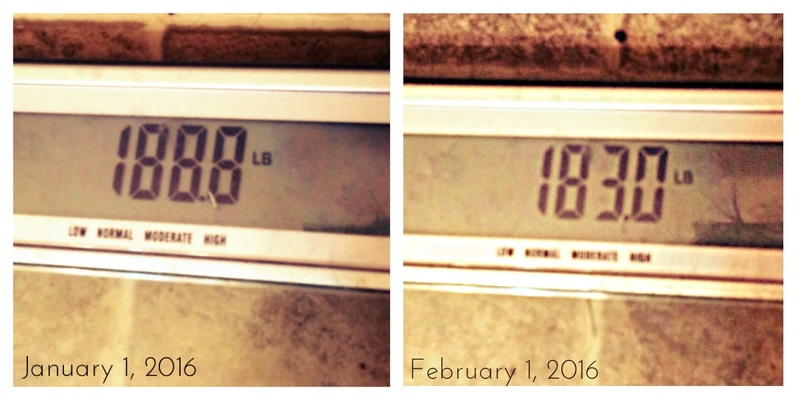 5.8 POUNDS DOWN! So thrilled to be getting, officially, back on track. Been doing better with this, too, though I'm not taking it quite as seriously as I should. I had eggs and bacon at work one morning (they definitely weren't grass-fed...), and I wouldn't have done that if I actually were pregnant. But as far as the obvious stuff goes, like coffee or sodas, we're good. 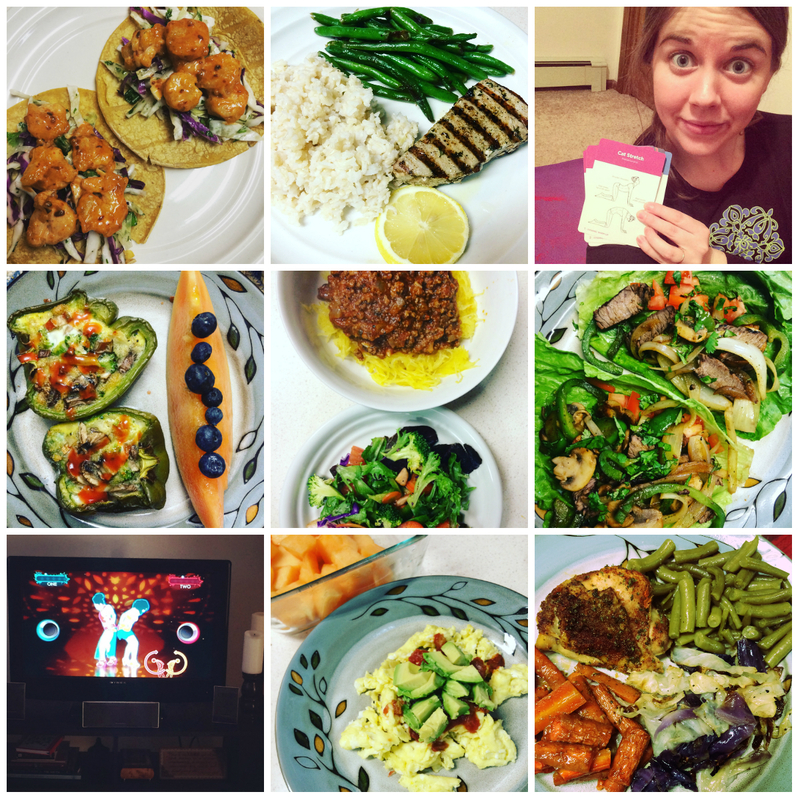 My goal starting out was to do one yoga session and one cardio session each week. So far, so good. I wanna bump it up to two of each this month, so we'll see how that goes! Did I mention how much better I feel?!? Eating foods like these make my body so happy. I've done this every single day so far, and wow, it makes such a difference in my state of mind at the end of what I'd just considered a crappy day. Even when I come home from work exhausted, in tears, and hangry, only to find that Annie pooped in the floor and pulled the stuffing out of our brand new couch, there are always multiple things for which I find myself deeply grateful. 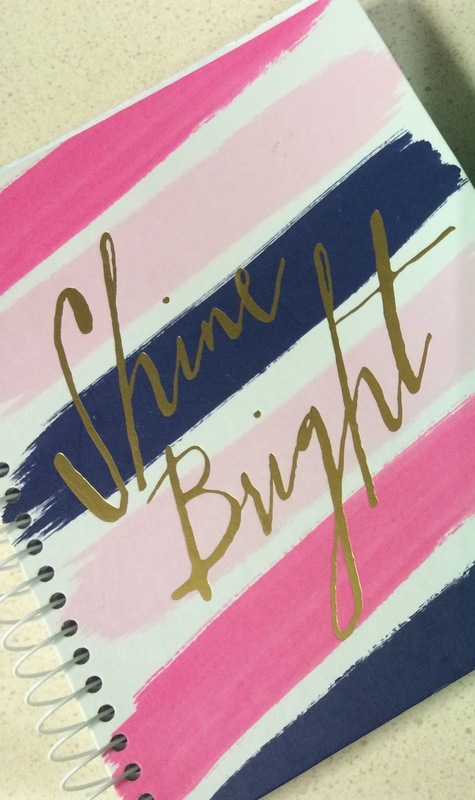 I was using a tiny, plain $0.88 notebook from Walmart to keep track of all my daily blood glucose checks, vital signs, PRN meds administered, and all those other nurse notes we have to make all day to keep from losing it. I thought I'd splurge a little and get a nice one that I'd enjoy writing in. Also, the message on the front encourages me to be a light to the people I'm caring for each day; the lonely elderly/disabled people who are stuck spending their days in a long-term care facility. The little things do help. I actually applied for an online, work-from-home job captioning videos on YouTube. Sadly, I ended up having to stay so late at the nursing home on the day of my first non-paid assignment (kind of an orientation type thing) that I missed my first deadline. Pretty horrible, I know. I'll keep looking though. We've been budgeting $50 each for Matt's personal money and Jen's personal money each month. That's our money to do whatever we want to do, guilt-free and accountability-free. I'm proud to announce that I saved $20 of my personal money this month for this. With the exception of last week (when I ended up staying late at work almost everyday because of state inspection and just getting behind because of too many assigned tasks), I've been doing pretty well with this. I called my mom, my sister, and my aunt a few times, and of course, I've been texting regularly in between phone calls. I really want to get better at this. I'd like to send cards, too. Maybe for Valentine's Day. I've updated my resume and I'm checking job postings almost daily. So far, no luck. But I'm not giving up yet. I made it through another month. And it was one of the worst ones yet. So. Yay. Welllllllll...I just haven't made the time for this one yet. Maybe I'll give creative writing a go this month. So, that's where I am so far in 2016. I'm definitely making progress in some areas and quite obviously slacking in others. How about you? Share in the comments! Wow, great update! I'm so proud of all your efforts. It would have been sooooo easy to blame your job for lack of progress on your weight/eating, Bible and church time, etc. But instead you made January a month to really be proud of. And surely working all those overtime hours counts as something that will help with the debt snowball. Speaking of which, I didn't get a chance to comment on your previous post, but your progress in that area is amazing as well! Congrats! I'm extremely happy that you've been able to go to church together on your off days. I'm gonna keep praying for you and for all the challenges you've been facing. Miss you lots!